Normally I layer colors, but today I am going to "charge" wet colors into one another. I want these colors to be strong enough that I won't have to add any layers of pigment later, but I want them to be wet enough that they will blend together and be transparent. I have used French Ultramarine Blue in the areas where the strongest shadow is, Permanent Alizarine Crimson, Winsor Red, and New Gamboge for the other colors. Before I begin, I want to be sure my pigments are very wet, and well-mixed, so they are ready to dip into for the process of "charging". To begin, I dip into the French Ultramarine Blue with a number 10 round brush. I can't emphasize enough the importance of WET pigment. 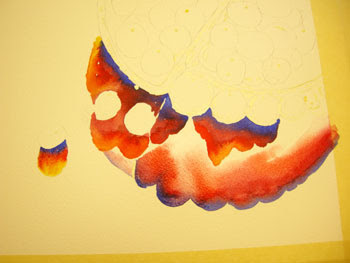 I lay a small path of pigment (not more that a 2-inch length) and quickly clean the brush and dip into the next color. I lay the next color next to the blue, just barely touching the colors so that the blue runs into the next color and softly blends. Continue this process until an area is filled in. Pay attention to the values and shadow shapes so that your areas make sense. Be bold and use strong, wet pigments. Allow this to dry. 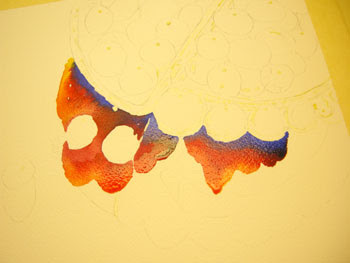 Notice in these photos, even though I have already applied the pigments, they are still shiny and wet. If you work wet, the colors will blend much more easily without having to fuss over them with your brush!